Porches have a way of evoking early memory — connections that linger, sounds and images of the moon, dream-lit faces, lightning bugs, voices, and song. Porches, a place where people gather with relatives, friends, and lovers to party, protest, shell peas, knit, play cards, talk and disclose secrets. Place to observe birds and dogs, insects, the stars at night, the neighbors, passing strangers and cars. Place where stories collect and unfold. This anthology of porch-themed tales will linger long after the pages have been read. Grab a seat, enjoy the varied views from this porch, have a mint julep, sip a sweet tea, take a swig of whiskey. Sit back and enjoy these tales. Alexis Ivy is from Boston, Massachusetts. Her most recent poems have appeared in Off The Coast, Spare Change News, Hubbub, Common Ground Review, The Chiron Review, Tar River Poetry, The Santa Fe Literary Review, Eclipse, and J Journal. Her first poetry collection Romance with Small-Time Crooks was published in 2013 by BlazeVOX Books. Amy Small-McKinney is the author of a collection of poems, Life is Perfect (BookArts Press) and two chapbooks of poetry, Body of Surrender (2004) and Clear Moon, Frost (2009), both with Finishing Line Press. She was nominated twice for a Pushcart Prize. Her work has appeared in numerous journals, such as The Cortland Review, The Pedestal Magazine, upstreet, Blue Fifth Review, SAND, Berlin’s English Literary Journal, Switchback (U of SF), and LIPS Magazine. She was the 2011 Montgomery County Poet Laureate, selected by poet, Christopher Bursk. She is founder of the program, Finding Our Voices: Poetry & Resilience, using poetry to help others, particularly those struggling with mental health, to find their voices. Angela Ogburn is a transplant from south Georgia now living in the northwest suburbs of Chicago. She teaches Human Services, College Success, and Career Development at Elgin Community College. Her work has previously appeared in The Chronicle of Higher Education and Academic Advising Today. Holding a Master’s degree in Clinical Psychology, she enjoys writing about the interpersonal dynamics between characters whose lives intersect in moments of chaos. She is currently working on two young adult novels, which she expects to finish while living in Seville, Spain for the next six months. A resident of Pittsboro, NC, Ashley Memory has published essays and short stories in a number of publications, including Cairn, Portland Literary Review, Wildlife in North Carolina, and Romantic Homes. She is a two-time winner of the Doris Betts Fiction Prize, a Pushcart Prize nominee, and has written speeches for two governors and numerous other public officials. Her first novel, Naked and Hungry, was selected as a finalist in the 2009 James Jones First Novel Fellowship sponsored by Wilkes University and was published in November 2011 by Ingalls Publishing Group of Boone, N.C. In April 2013, she earned first honorable mention in the Thomas Wolfe Fiction Contest sponsored by the NC Writer’s Network. Ava (or Aviva) Lilith Van Pelt, 14, grew up on a magical farm near Binghamton, New York. She has been writing short stories since she was about six years old. In addition, she acts, dances and is a filmmaker. She has had a few struggles in her life and those struggles make her a writer. Someone important to her once said: “fight the demons, keep the crazy” — which always stays with her. Her mother gave her the best gift a writer can get: an imperfect life. She dreams of traveling around the world and writing. To places she doesn’t know exist. On weekends, there’s nothing she loves more than watching the rain. Benjamin Pressley is an Instructor of English and Religion at Mitchell Community College. He holds a BA in English from Pfeiffer University, an MA in English Lit from UNC-Greensboro, and an MA in Religious Studies from Earlham School of Religion in Richmond, Indiana. He is a hiker and a reader, devouring political books by everyone from Karl Marx to Ron Paul, and was once in a sort of bluegrass/country gospel/Uncle Tupelo cover band. His heroes are William Blake, Gandhi, Buddha, Jesus, Martin Luther King, Nietzsche, Bob Dylan, Terrence Malick, Thomas Merton, Christopher Hitchens, and Shakespeare. He considers both Lee Smith and Charles Bukowski strong influences on his writing. This is his first published work, other than his two master’s theses. Residing on California’s central coast after teaching literature and writing for many years in Southern California, Beverly Boyd co-hosts a quarterly poetry reading series at a local library. Her poetry has appeared in such journals as Conclave, Earth’s Daughters, English Journal, Healing Muse, Poem, and Slant. Bill Griffin is a family doc and geriatrician in rural North Carolina. “Overflowing” is Bill’s second published short story. His poems have appeared in many regional and national journals including Tar River Poetry, NC Literary Review, Pembroke Magazine, and Southern Poetry Review. In 2010 the choral suite The Wanderer’s Carols, lyrics by Bill and original score by Mark Daniel Merritt, premiered for Christmas at Biltmore House in Asheville, NC. Bill’s published poetry collections include Barb Quill Down (Pudding House 2004), Changing Woman (Main Street Rag 2006), little mouse (Main Street Rag 2011), and Snake Den Ridge, a bestiary (March Street Press, 2008) in collaboration with his wife, artist and historian Linda French Griffin. Bill promotes the work of NC poets at his blog GriffinPoetry.com. Blanche Farley, Dublin, Georgia, a retired teacher and librarian, has published poems and stories in Calyx, Confrontation, Southern Poetry Review, Tar River Poetry, and various other journals. Her work is also included in The Bedford Introduction to Literature, The Signet Book of American Humor and The Southern Poetry Anthology (V.5). In 1996, she co-edited a food poem collection, Like a Summer Peach: Sunbright Poems and Old Southern Recipes (Papier-Mache’ Press). She has been a PEN Syndicated Fiction winner. She holds Master’s degrees in art education and library science, and is a graduate, as well, of the MFA Low Residency Creative Writing Program at Warren Wilson College, Swannanoa, NC. Award-winning author and Pushcart Prize nominee Bob Strother has had over eighty short works of fiction and poetry appear in a number of literary journals and magazines. His collection, Scattered, Smothered, and Covered was published in 2011, and his novel-in-stories, Shug’s Place, was released in 2013, both through the Main Street Rag Publishing Company. Bob was the recipient of the 2012 Hub City Writers/Emrys Foundation Fiction Prize, and has received other awards and recognition from a variety of literary organizations. He was featured in, and is a contributing writer for Southern Writers Magazine. A long-time member of the South Carolina Writers’ Workshop and the Gulf Coast Writers’ Association, Bob lives with his wife, Vicki, in Greenville, South Carolina. Carrie Knowles writes both fiction and non-fiction. She has two novels, Lillian’s Garden, April 2013 and Ashoan’s Rug September 2013, both published by Roundfire Books, an audio book Shoot Me, Mind Wings Audio, 2009, and a short fiction piece Searching for Clint Eastwood, Amazon 2012. She also has a non-fiction memoir, The Last Childhood: A Family Story of Alzheimer’s, Three Rivers Press 2000. In addition, she has published numerous articles and short fiction in anthologies, newspapers, magazines and literary journals, and won numerous literary awards, including: NCWN Fiction Syndication Contest, The North Carolina Writers Network Rose Post Award for Creative Nonfiction, and Glimmer Train’s Very Short Fiction Award.Carrie and her husband, Jeff Leiter, live in Raleigh, North Carolina. They have three children. Charmaine Vannimwegen was born in the Philippines and immigrated to the U.S. at the age of eleven. She holds a BA in US History from University of California, Riverside and is currently working toward an MA in English at California State University, Fullerton. While in academic settings, her official favorite book is Pride and Prejudice, but a big blue copy of The Hitchhiker’s Guide to the Galaxy occupies a permanent spot on her night stand. She lives in Riverside, California with her husband Jason, their two dogs Rex and Jack, and a cat named Kitty. This is her first publication. Christopher T. Werkman completed a thirty year career as a high school art teacher in 2000. He still paints, but his primary passion is writing fiction. He lives on a few acres outside Haskins, Ohio, with is partner, Karen and too many cats. He plays golf in the summer, tennis all winter, and rides his motorcycle whenever the roads are dry. Among his publishing credits are, in literary journals: Word Catalyst Magazine, Litro: Stories That Transport You, Journal of Microliterature, 5923 Quarterly, Specter Magazine, Edge volume 7, Penduline Press, Cigale Literary, Epiphany ; and in anthologies: Hannibal’s Manor, Short Sips–Coffee House Flash Fiction, and Daily Flash: 366 Days of Flash Fiction. David Plumb has worked as a paramedic, cab driver, cook, tour guide, and adjunct professor. A native of South Carolina, Diana Pinckney lives & teaches in Charlotte, NC She has published poetry in Iodine, Green Mountains Review, Calyx, Cream City Review, Cave Wall, RHINO, Connotation Press, The Main Street Rag & numerous other journals & anthologies. She is the winner of the 2010 EKPHRASIS Prize and Atlanta Review’s 2012 International Grand Prize. Five times nominated for a Pushcart Prize, Pinckney’s collections of poetry are: Fishing with Tall Women — Contest Winner in South Carolina Poetry Society’s Kinloch Rivers Memorial Chapbook Award and NC Persephone Press Award, White Linen, Nightshade Press, Alchemy, Main Street Rag Publishing Company and Green Daughters, Lorimer Press. Dolores Hayden’s poetry collections are American Yard (2004) and Nymph, Dun, and Spinner (2010). Recent work appears in Poetry, Raritan, The Yale Review, Shenandoah, Best American Poetry, and American Scientist. She’s won awards from the Poetry Society of America and the New England Poetry Club and been a poetry fellow at Djerassi and the Virginia Center for the Creative Arts. She is also the author of several non-fiction books on American urban landscapes including The Power of Place and A Field Guide to Sprawl. A professor of architecture and American studies at Yale University, she teaches a class called “Poets’ Landscapes.” Her web site is www.DoloresHayden.com. Gail Peck is the author of three poetry chapbooks and three full-length collections, most recently Counting the Lost. Poems and essays have appeared in numerous journals and anthologies including The Southern Review, Nimrod, Greensboro Review, Stone Voices, Mississippi Review, Rattle, Connotation Press, Brevity, Apple Valley Review, Kakalak, The Main Street Rag, and Cave Wall. Her poems have been a finalist and semi-finalist for Nimrod’s Pablo Neruda Award. Both Nimrod and Cave Wall have nominated her work for a Pushcart. Gayle Compton has worked as a coal miner, radio DJ, office factotum and English instructor. His writing ranges from Rabelaisian satire to serious metered poetry. The majority of his characters are Winesburg stereotypes, at large in Appalachia. For more than thirty years his work has appeared in Appalachian Heritage, Sow’s Ear, New Southerner, Now and Then, The Kentucky Anthology and elsewhere. Among his awards is the Appalachian Heritage Award for Writing Excellence, the George Scarborough Poetry Prize, the Kudzu Poetry Prize and several Pushcart nominations. Black Lung Washing Machine, a story collection set in an Eastern Kentucky coal mining community, is forthcoming from Wind Publications. Compton supports nine cats and a wife in rural Pike County, Kentucky. Geri Radacsi is the author of three collections of poetry: her prize-winning chapbook, Ancient Music (Pecan Grove Press); her full-length poetry collection, Trapped in Amber(Connecticut River Press); and Tightrope Walker (Antrim House). She has been a journalist, English teacher, communication/media specialist, and freelance writer. Currently, she is Associate Director of University Relations, Emerita, at Central Connecticut State University in New Britain, Connecticut. Among her publishing credits are The Atlanta Review, Embers, Comstock Review, Connecticut Review, Yale’s Caduceus, Sycamore Review, Iron Horse Review, MacGuffin, Nimrod, Karamu, Southern Poetry Review, and The Southern Humanities Review. She has been nominated for a Pushcart Prize, is the 2003 winner of the Connecticut River Review Poetry Prize, the 2013 Savard Memorial Poetry Competition, and has won several awards from the Connecticut Poetry Society. Her poems, choreographed for dance and cello interpretation, have been featured in live performances at CCSU and at the New Britain Museum of American Art. Heather Grant has contributed poems to Blueline, Spillway, Hawai’i Pacific Review, Sufi Journal (forthcoming), poetsagainstthewar.org, Journey into Love, Whose Woods These Are, Cypress Review, and has self-published the chapbooks Light to See By (with Elsha Bohnert and Patrice Wilson), Enfolded in Your Embrace, and Chasing the Shadow. Heather is an elementary ESOL teacher (English for Speakers of Other Languages) and has taught poetry in after-school programs, summer workshops, and to ESOL students in public schools. Heather is an advocate of arts integration and has given workshops to Washington, DC area ESOL teachers on the benefits of using poetry to teach English. She lives with her husband Web, a jazz drummer, and their three children in Falls Church, Virginia. Henri Bensussen lives on the Mendocino coast of California, serves on the board of the Mendocino Coast Writers Conference, and enjoys baking. One of her father’s favorite responses to a childhood kerfuffle was, “Can’t have your cake and eat it, too,” which she never understood. What was a cake good for if not to be eaten? And why was Mom always trying to pry her away from books, as if reading were a sin? Prompted to write about porches, she responded with “Waiting for the Cake.” It sums up her years as a sub-adult. Artist/writer, Jan B. Parker lives and works in the small southern town of Fuquay-Varina, just south of Raleigh, NC. Her latest publishing credit is with South Writ Large (Fall 2012), and her latest award is Second Place in the 2013 Beaufort Count Arts Council Literary Competition. Jan is a Trustee of the North Carolina Writers Network and hosts the popular Third Thursday Open Mic Night sponsored by Main Street Rag and held at Stars Theater and Art Center in her hometown. Please visit Jan at www.writerjanbparker.com, her Facebook author page, and the Third Thursday Open Mic Facebook page. Jennifer Clark lives in Kalamazoo, Michigan. Her first book of poems, Necessary Clearings, is slated for publication with Shabda Press in the summer of 2014. Failbetter, The Main Street Rag, Solo Novo, Windhover Journal, and Fiction Fix are some of the places that have made a home for her writings. She is currently working on the sequel to an edgy middle school adventure story. Both the original and sequel are seeking a publisher. Joan Leotta has been writing since she could hold a pencil. Her published work includes poetry, several fiction and non-fiction books, short stories and hundreds of magazine and newspaper articles. 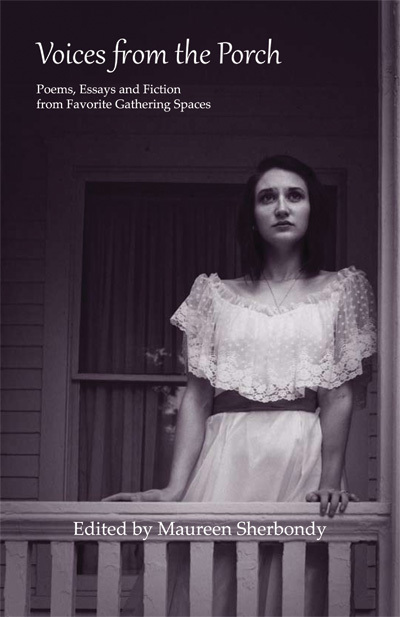 The porch in her story is inspired by the porch at her Grandmother’s house in Pittsburgh. She also performs in one woman historical shows and folklore performances at fairs, festivals schools, libraries and any place there is an audience. You can find references to her latest work at :www.joanleotta.wordpress.com and on her Facebook page Joan Leotta Author and Story Performer. When not writing or performing, Joan can be found relaxing with her husband, Joe and daughter Jennie at home. Judith Behar grew up in Brooklyn, NY, taught English at Guilford College in Greensboro, North Carolina, and later practiced law in Greensboro for about 30 years. She served as co-editor of an anthology, Lines from a Near Country, has had poems and short stories published in several magazines and anthologies, including The Main Street Rag, Fire and Chocolate, and WordWorks. She has led poetry workshops at HopeWell Cancer Support in Baltimore, Maryland; currently, she’s the volunteer publicity director for Writers Group of the Triad. She resides in Greensboro. Katharyn Howd Machan, professor in the Department of Writing at Ithaca College, is the author of 30 published collections of poems, including Redwing: Voices from 1888 (FootHills Publishing), When She’s Asked to Think of Colors (Palettes & Quills), and The Professor Poems (Main Street Rag Publishing). Her poems have appeared in numerous magazines, anthologies, and textbooks, including The Bedford Introduction to Literature, Sound and Sense, Poetry: An Introduction, and Stand Up Poetry. In 2012 she edited Adrienne Rich: A Tribute Anthology (Split Oak Press). In 2010 she gladly moved away from the house at which “Porch” is set. Kathryn Bright Gurkin is the author of four books of poetry and a collection of comic essays, Zen Ironing (Main Street Rag, 2003). Awards and nominations include the Brockman Book Award, NC Poetry Society, 1980; the Sam Ragan Award in the Fine Arts from St. Andrews College, 1994; Pulitzer Prize in Poetry nomination, 1990; two nominations for the Pushcart Prizes and various awards from literary magazines for individual and group poems. Kathryn Shaver spent several decades at the helm of the advertising agency she founded, then developed an international consulting practice for private companies in former Communist bloc countries. After retiring from the business and civic community in 2003, she completed an MFA in Fiction from Spalding University. Her first published story was awarded the 2008 Fiction Prize for Inkwell Journal. Since that time, her stories have appeared in numerous publications including Narrative Magazine, the Louisville Courier-Journal, and several anthologies. Louisville, Kentucky, native, she was graduated from Auburn University with a degree in design, and continues to utilize her early art training in painting, portraiture, and fiber arts. She divides her time between Louisville and Savannah, Georgia. Laura Glenn has a book of poems, I Can’t Say I’m Lost, published by FootHills Publishing. Her poems have appeared in many journals, including, The Antioch Review, Boulevard, Epoch, Green Mountains Review, Literal Latté, Massachusetts Review, Poet Lore, Poetry, Rattapallax, and Small Spiral Notebook, as well as the anthology, A Fragile Index of the World. The recipient of a CAP fellowship in poetry, Laura Glenn is working on a second book-length manuscript of poems. Also a visual artist, she paints, creates abstract collages, and digital prints. She live in Ithaca, NY, with her husband, where she works as a freelance editor. Laura Quinn Guidry grew up in New Orleans and lives in Carmine, Texas. She began writing poetry in her forties and published her first poem at age 52. Her poems have been published in journals including The Texas Review, Louisiana Literature, Concho River Review and descant and in the anthologies The Weight of Addition, In the Eye and Shadow and Light. Her work has also been published in the Texas Poetry Calendar. A collection of her poems appears in In These Latitudes – Ten Contemporary Poets. She was a featured poet at Poetry on the Move in San Antonio in 2012. Linda Legters writes, teaches, and paints in Connecticut. Her stories have appeared in numerous literary journals, including Glimmer Train, Alaska Quarterly Review, and StoryQuarterly. She is delighted to contribute “From Her Tiny Porch,” an excerpt from her novel, Waiting, to this anthology. Lori D’Angelo’s work has appeared or is forthcoming in various literary journals including The Bakery, Connotation Press, dirtcakes, disClosure, Drunken Boat, Everyday Genius, Forge, Gargoyle, Hamilton Stone Review, Heavy Feather Review, Juked, Literary Mama, LOUDmouth, The New Verse News, Pequin, Praxis, Prime Number Magazine, Red Lighbulbs, r.kv.r.y., Reed Magazine, Spittoon, Stirring: A Literary Collection, Stone’s Throw Magazine, and Word Riot. She is a fellow at Hambidge Center for Creative Arts and Sciences, a grant recipient from the Elizabeth George Foundation, and an alumna of the Squaw Valley Community of Writers Fiction Workshop. She lives in Virginia with her family and teaches writing. Marian Brown St.Onge retired six years ago from her position as founding Director of the Center for International Partnerships and Programs at Boston College, where she also taught French and directed BC’s Women’s Studies Program. Her publications include more than twenty poems and several articles on women writers, cultural issues and topics in international education. Beyond her poetry, St. Onge is working on a biography of a World War II French Resistance fighter for which she received a Norman Mailer Fellowship award in 2009. Mark DeFoe is Professor Emeritus of English at West Virginia Wesleyan College where he teaches in Wesleyan’s low-residency MFA Writing Program. Widely published, DeFoe’s work has appeared in journals, magazines and textbooks in the US, Canada and Great Britain. He is the winner of the 2005 Chautauqua Literary Journal’s national poetry competition. He was awarded two Artist Grants from the WV Commission for the Arts, and his work was twice nominated for Push Cart Prizes. In 2009 he won the Tennessee Chapbook Award. His tenth chapbook, In the Tourist Cave, was published in 2012 by Finishing Line Press. Martha Golensky relocated to Greensboro, NC, in 2006 after a successful academic career at Grand Valley State University in Grand Rapids, MI, that included publication of numerous journal articles in her field of nonprofit management. In 2011, her book Strategic Leadership and Management of Nonprofit Organizations was published by Lyceum Books. Always a lover of poetry, she did not begin writing in this genre until the last week of a class in contemporary poetry in 2010. She credits the classes she has taken subsequently but especially the constructive feedback from her colleagues in the New Garden Friends Poetry Group for helping her hone her skills. Marty Silverthorne holds degrees from St. Andrews Presbyterian College and East Carolina University. He has published four chapbooks Dry Skin Messiah, Pot Liquor Promises, No Welfare, No Pension Plan, and Rewinding at 40. He has received the Bunn-McClelland Chapbook Award, the Persephone Press Award, and the Sam Ragan Award. He has also been awarded several North Carolina Regional Arts Council Grants and in 2012 received an NC Arts Fellowship. Marty has been published in numerous journals including Tar River Poetry, North Carolina Literary Review, St. Andrews Review, The Main Street Rag, and Pembroke, and his work has been anthologized. Melissa Walker lives, writes, and teaches history in Spartanburg, South Carolina. She is the George Dean Johnson, Jr. Professor of History at Converse College and the author or editor of eight books on Southern history including All We Knew Was to Farm: Rural Women in the Upcountry South and Southern Farmers and Their Stories: Memory and Meaning in Oral History. She has spent her life listening to stories about the Southern past and committing them to the historical record. She hopes to spend the rest of her life telling a few stories of her own. Miranda Moody Miller grew up in a small mill town in Maine where she learned to disappear in the woods and appreciate the smell of cow manure. After receiving a BA in English and American Literature from Brandeis University, she moved to Los Angeles where she taught high school English for five years before returning to the East Coast to complete an MFA in Creative Writing at Emerson College. She currently lives off-grid in East Corinth, VT with her husband, two dogs and six ducks. When she isn’t gardening or writing she can be found performing locally as a singer-songwriter, fly-fishing, or training for her next triathlon. M.S. Rooney lives in Sonoma, California with her husband, poet Dan Noreen. Her work appears in journals, including Bluestem, The Cortland Review, Earth’s Daughters, The Main Street Rag, Theodate, and 3:AM Magazine, and anthologies, including American Society: What Poets See, edited by David Chorlton and Robert S. King (FutureCycle Press), and Journey to Crone, edited by S. Philip (Chuffed Buff Books). Nancy Benjamin can be found on summer days sitting on her screened porch in Chapel Hill, North Carolina, where she lives with her husband Jack. A former high school teacher of French and Russian, she has authored two non-fiction works, Children in Need and Grandparents’ Guide to Books for Babies, and a book of poems, To Every Thing There is a Season. Nancy McKinley has stories in Main Street Rag Short Fiction Anthologies: Commutability: Stories About the Journey from Here to There, a Pushcart Prize nomination, Tattoos, Coming Home, Big Water; The Cortland Review, Blue Lake Review; Becoming Anthology (U of Nebraska); and Colorado Review. She teaches in the low residency M.A./M.F.A. at Wilkes University. She earned her Ph.D. from SUNY-Binghamton, M.A. from Colorado State University, and B.A. from College of the Holy Cross where she was one of the first females at the previously male school. Nancy Young plays with words the way some people play with jigsaw puzzles. She’s fit writing into her many incarnations as a reporter, editor, playwright, novelist, poet, and college instructor. Her work has appeared in newspapers, journals, and magazines, including fresh, Iodine Poetry Journal, The Main Street Rag, moonShine review, Outreach NC, and Pinesong, and has been performed on stage. The Last Girl Standing, her poetry chapbook, will be published in 2013. Nancy lives in Fuquay-Varina, North Carolina, because she likes to listen to telemarketers try to pronounce it. There, with her tolerant husband, she’s raised four functional children, a spoiled basset hound, and two ungrateful cats. Patty Cole is a 2012 North Carolina Poetry Society (NCPS) honorable mention in the poet laureate contest and a 2011 Fields of Earth poetry competition finalist. Her credits are The Wild Goose Poetry Review, The Living Poetry Now, The Sound of Poets Cooking (anthology), The Main Street Rag, Vox Poetica, Mused-The Bella Online Literary Review, The Melancholy Dane, and Solstice. She lives in Bonlee, North Carolina on a 17 acre farm where she and her husband raise chickens. To stay sane she writes, practices NIA dance exercise and takes lots of walks on her farm. Robin Silbergleid is the author of the chapbook Pas de Deux: Prose and Other Poems (Basilisk Press, 2006). Her essays and poems have appeared recently in Hospital Drive, The Citron Review, Thin Air, Rattle, and elsewhere. She teaches at Michigan State University, where she directs the Creative Writing Program and serves as faculty adviser to Red Cedar Review. She lives with her family in East Lansing, Michigan. Robyn Parnell’s short stories have appeared in over ninety anthologies, magazines and journals (several of which have not filed for Chapter 11 protection). Her books include a short fiction collection, This Here and Now (Scrivenery Press), a children’s picture book, My Closet Threw a Party, (Sterling Publishers, illustrated by Jimmy Pickering) and her recently released middle grade novel, The Mighty Quinn (Scarletta Press). Current projects include finding publishers for her adult novel, a second short fiction collection and two picture books while note-taking and “world-making” for second adult and juvenile novels. Parnell lives and writes in Hillsboro, Oregon. A graduate of Northeastern University, Boston, MA., she married, had three children and then, after being widowed, served as Director of Development at a pediatric hospital specializing in children with disabilities. “Isn’t it difficult asking people for money?” was a frequent question. Her answer was always the same. “Not when you believe in the mission and you know the impact of the gift.” And so it has been since she began writing poetry. Seeking the impact of a word, an image–writing because not to was not an option, and always the possibility that out there is someone who may find something beyond the words. Her poems have appeared in Ibbetson Street, Longfellow Journal, Lilliput Review, Hazmat Review, Village Voice, Hidden Oak and anthologies. Ruth Moose was on the Creative Writing faculty at UNC-Chapel Hill for 15 years. She’s published three collections of short stories, The Wreath Ribbon Quilt and Dreaming in Color and Neighbors and Other Strangers with individual stories in Atlantic, Alaska Quarterly Review, North American Review, Southern California Review and other places including publications in Holland, South Africa, England and Denmark. Moose has published six collections of poetry, most recently, The Librarian and Other Poems and Tea. She’s received a MacDowell Fellowship, a North Carolina Årtist Fellowship and a prestigious Chapman Award for Teaching. She lives in Pittsboro, NC. Her novel, which won the Malice Domestic $10,000 prize, will be published by St. Martin’s Press in 2014. Sally Whitney’s short stories have appeared in literary and commercial magazines, including Bloodroot Literary Magazine, The Main Street Rag, Kansas City Voices, and Pearl, and anthologies, including New Lines from the Old Line State: An Anthology of Maryland Writers and Grow Old Along With Me—The Best Is Yet to Be, among others. The audio version of Grow Old Along With Me was a Grammy Award finalist in the Spoken Word or Nonmusical Album category. Whitney’s stories were also semi-finalists in the Syndicated Fiction Project and the Salem College National Literary Awards competition. She lives with her husband in Millersville, Maryland, and is currently working on a novel. Sandy Richardson wrote The Girl Who Ate Chicken Feet published by Dial Books for Young Readers, which received an outstanding merit rating from Bank Street College’s The Best of Children’s Books (1999). It was nominated for the South Carolina Junior Book Award in 2001-2002. Mrs. Richardson’s fiction and nonfiction have appeared in several anthologies. She has served as a ghostwriter, editor, and contributing writer for numerous publications and is presently at work on completing two novels and a memoir. Retired from teaching high school, she plans to read, write, and resume leading her writing workshops on fiction and family stories. Mrs. Richardson lives in South Carolina and serves as leader for the Sumter Chapter of South Carolina Writers Workshop. Sharon Kurtzman’s writing has been published in print and online at All Things Girl, moonShine Review, Scruffy Dog Review, Airplane Reader and Still Crazy. Her short fiction has been featured in the Raleigh News and Observer “Sunday Reader” series for emerging Southern writers. An essay was published in the 2013 edition of Chicken Soup for the Soul: Inspiration for Writers. Her fiction has been recognized by North Carolina State University’s annual writing contest and the William Faulkner-William Wisdom Writing Competition. Her novel, Cosmo’s Deli, was published by Boson Books. In 2012, she ran her first marathon, after which she checked it off her Bucket List. Sterling Slechta is a writer originally from Central New York, a region that serves as inspiration for many of the settings and themes of his fiction. He studied religion at Syracuse University and now lives and works in Astoria, New York. His work appears in Children, Churches, and Daddies, Red Lightbulbs, and Mirror Dance. Suruchi Mohan made her entrée into fiction writing in the late nineties. Her debut novel, Divine Music, was published in the fall of 2009. A native of India, she is an award-winning journalist who covered high-tech and business news for McGraw Hill and International Data Group publications through the nineties. She has written columns for Progressive Media, from where they were distributed to newspapers throughout the country. In the eighties and nineties, her nonfiction appeared in San Jose Mercury News, Reader’s Digest, Sacred Fire, Business Journal, and numerous other publications. Her fiction was recently published in Bryant Literary Review. Susan Eisenberg, poet, installation artist, essayist and activist, is author of the poetry collections Pioneering, Blind Spot, and Perpetual Care (forthcoming), and the nonfiction, We’ll Call You If We Need You, a New York Times Notable Book. Introduced to the craft of poetry by Denise Levertov, she later earned an MFA at Warren Wilson College, and taught for a decade at the University of Massachusetts. Currently a Resident Artist/Scholar at Brandeis University’s Women’s Studies Research Center, she has two touring exhibitions: On Equal Terms, about women in the construction industry, and Perpetual Care, exploring chronic illness. Susan lives in Boston, but grew up in Cleveland, in a house that had five porches. Wanda S. Praisner, a recipient of fellowships from the NJ State Council on the Arts and the Geraldine R. Dodge Foundation to the Provincetown Fine Arts Center and the Virginia Center for the Creative Arts, is a five-time Pushcart Prize nominee. She’s won the Egan Award, Princemere Prize, Kudzu Competition, and First Prize in Poetry at the College of NJ Writers’ Conference. She was a featured reader at the Governor’s Conference on the Arts and the Dodge Poetry Festival. She appears in Atlanta Review, Lullwater Review, New York Magazine, Prairie Schooner, and elsewhere. Her third book, Where the Dead Are, from CavanKerry Press, made its debut at the 2013 AWP Convention in Boston. She is a resident poet for the State Council on the Arts. to sit side by side in its wooden swing. of a rocking chair, and a song to sing. no one, and no one’s neighbor’s ghost. no wife pouring margaritas, nothing to toast. No hanging pots. No gardener with shears. No wife pouring margaritas. Nothing to toast. A green tangle holds sway, undoes the years. Plywood, where the front door’s gone. The giant oak’s roots move under, press on. A volunteer maple. A wild young ash. Lush ferns mingle with bits of trash. There’s a way through a window around the back. The addict. The dealer. When the sky turns black. of your gut. Here the world begins and ends. Time comes unmoored when we approach a porch. peas like corn husks before the drying begins. down a narrow hallway behind the kitchen. My brother’s eyes change from brown to wine and the low voice drifts through the screened porch. Masked in ribboned light, his profile shows tracks of hard times, years we didn’t see each other. Our memories don’t match, and people wear different faces depending on who tells the story. He knows a time before mine, when our parents were young, perhaps even happy. I also know a time. He and I probe, pull the past across our separate lives, listen for echoes. Night air presses, stirring shadows and moths. A canary calls from the sun porch of the house where I grew up in Columbia, South Carolina. On that porch, a card table stays up for slap jack, rummy, Russian bank; duels played between my brother and me, more often between my mother and father or aunt and grandmother. My small, quiet grandmother with her winning red and black canastas. My aunt rises so quickly from her losses; she bumps the table, fleeing the game and house — back to the office and her law cases. These hands are dealt daily after one o’clock lunch, which we call dinner. At night, after supper, my parents march their cards across the table while my grandmother sews upstairs in a soundless world of threads and African violets, lavender and purple scalloped across her window sill. The double-covered canary in his corner is also silent, his head under his wing, the cage draped by a fringed shawl. My mother and father line up two decks opposite each other. Stretched out beside the dog, Prince, I color within the lines. The floor fans hum across cool flagstone. I don’t hear the termites munching through the Encyclopedia Britannica on the bookshelves beneath the windows. Those small tunnels from Acacia through Zambia will be discovered a few years later when I research a school report. Now there is just the ruffle and click of cards. Prince, with his head between black and white paws, keeps his Spaniel eyes on my mother as if he, too, knows she is beautiful. Beneath my Aunt Bet’s second floor apartment near the university, students thump across the porch, unload bags, packs, stacking them against the railing. I am spending the evening at her apartment where I frequently have supper and sometimes spend the night. My aunt and I scrape our rockers in the damp air on her balcony and discuss The Yankees and Mantle’s home run just bellowed from her sturdy Philco. We wait for my brother, who will continue to come and go in my life for many years as he moves from west to midwest and finally back south again. At this juncture he is home on leave from the Air Force and has borrowed Bet’s car. My father’s is a company car only he is allowed to drive. Mother drives it whenever she pleases. Eventually I learn behind the wheel of a friend’s car. The street below us sends up its back-to-school sounds. Apartments and duplexes once again mixing their older non-student renters with the young, who rotate through their doors, as the college calendar changes, like hourly figures on an old town clock. Volkswagens come and go, sputter to the waves of the The Platters lapping from the open windows of the house next door. An empty bottle rolls over the wooden steps, cracks on the walk and a few doors down, the first wail of a saxophone rises. Rocking in the rhythms of this late August tune-up, my aunt floats on the tides of entries and departures, learning and forgetting names, ignoring doorway collections of books, jackets and paper sacks that rattle and spill, the pyramid of empty beer cans growing on the back porch. She has closed her law books and retired, no longer wakes when she hears university bells clanging three blocks away. Maybe she dreams menus — cooking is a hobby she has taken up with a vengeance since retiring — planning one of her “Miss Bet” dinners for the new students downstairs. I dream my own migration up the sidewalk to answer those bells, where I cross the campus, its green holding the first curled leaves of fall. They sit, my father and his friend, Tally, on Tally’s front porch. Dark moves in with smoke from their Luckies and the zinging of crickets. Facing our house across the street, the narrow brick porch holds only two chairs. Wrought iron presses against backs already starting to soften — my father and Tally no longer play baseball and tennis for college teams. They sip their bourbons (which have not yet become a problem) and talk of the university’s fired football coach and how many classes Tally will teach in the fall. Tally’s daughter and I play under the magnolia tree just beside the steps, collecting grass and sticks for Mason jars with icepick holes in the tops. The round fires of the cigarettes move over the porch — up and glowing, down and dimming — like the fireflies that light the yard. My friend and I debate pinching the insects’ taillights to wear on our fingers like phosphorus rings or saving them in our bug jars. Laughing their slow laughs, the men smooth over the harsh words of last night’s bridge game, the flare of temper. Under our feet, glossy leaves crackle and under that, the musty scent of June’s rotting blossoms. We pile up magnolia seed-pods, fat and bumpy, perfect hand grenades for tomorrow’s war games. In a few weeks, when air raid sirens scream, our fathers will go together in their black civil defense hats and slickers while we wait behind dark shades for the return of these two men who lived between wars, too young for one and too old for the other. But tonight it is only the screen door that bangs as they go inside to freshen their drinks. And the whack of wood on leather that sings through the air behind the house where my brother and the older kids play sand lot ball. My mother walks through the front door and down the steps. I wonder what was said inside. She calls to me. Bedtime. After mild protests, Prince and I follow her across the street, the blinking jar under my arm, Mother’s creamy cotton dress and ripples of auburn hair lit by porch lights that don’t burn out, the way summer never leaves these porches. Love is no enigma. It’s hormones and pheromones. A matter of brain chemistry, you once said. But to me, love is a labyrinth. I’m lost in it, wandering through twists and turns, barriers I can’t see past. Sometimes I catch a glimpse of you darting around a corner. David, I call out. You don’t answer, because you think it’s a game, then sing my name when it appears I’ve given up. The last time, I find you sitting in your always-plaid undershorts on a metal kitchen chair, too small for the height of you. One sock and one shoe. You are contemplating your bare foot, elbows on your knees. Go through the gate and come in round the back, you had said, you were too weak to get to the door. I brought you some peonies from my garden. The red-streaked ones, the first to bloom. Lipsticks, I call them. Had you forgotten they were my favorite flower? Did you ever know that? You don’t say anything, just raise your eyes to me, put your hands where your elbows were, and hold yourself up with your arms. Then you grin. A crooked, boyish smile, the same as the night we met. Got any peanuts? you ask. Thirty years ago, in a trendy bar in Atlanta, its floor covered with peanut shells. I wore a scoop-necked sweater under my lucky pantsuit. Blue with navy trim. You, from the next table, aimed peanuts at my cleavage. I make space for the Lipsticks in the center of the table. Old mail, a stack of unsigned checks. A dozen prescription bottles, clustered, some without lids. A small clearing on the glass tabletop, smeared with jelly and crumbs. Clutter everywhere, the detritus of your existence. An athletic shoe, well past a useful life, spills a dirty sock. Tired jeans in a heap on the floor, a belt still in the loops, like a snake poised to strike. I take the unread newspapers off the other chair. The seat, besprigged with yellow flowers, a pattern selected no doubt by one of the women of your past. I pull the chair near, facing you, eye to eye. I couldn’t believe it when you phoned after these, what, four years? I made myself wait until Saturday to come. Packed a picnic of cold salmon and slender green beans with lemon. Pictures of my daughter, twenty-five now, with her baby. Stacy, named after me. What would you think of me as a grandmother? You touch my hair, the streak of white across the dark you always loved. I think of our first time together. Dom Perignon at that lavish hotel. You in cuff links and a blue shirt with a stiff white collar, sartorially evidencing the success you had attained on your own. I was dazzled. You, married. I was only twenty-six. But I was old enough to understand that you wouldn’t leave a wife and two children. When Sam came along, I married him. A sweet enough guy, but not enough. I tied myself to our daughter and the Junior League, because Sam expected it, and to a graduate degree, because I wanted it. How do you stop remembering when you must remind yourself to forget? I kept track of you, followed your rise through the energy industry, saw you move from city to city, divorce. And then, there you were again. Six years had passed. Lake Keowee. We spent ourselves in a secluded cove, then zoomed across the quiet lake. I stood next to you in the boat, you holding my breast, your other hand steering fanciful turns. You were a boy doing wheelies on his bicycle and I thought the boat would flip over. I was naked. We were both laughing. A good thing it was a Monday.